Bottom: Rho activation in Swiss 3T3 cells. F-actin is visualized with fluorescent green phalloidin staining (Cat.# PHDG1) and nuclear blue DNA staining with Dapi. Cells were activated with Cat.# CN03. Luo et al. recently discovered the novel GTPase activating protein (GAP), ARHGAP42, through a phosphotyrosine proteomics study. ARHGAP42 de-activates multiple Rho family GTPases, including RhoA. Here, the authors characterized the functional regulation of ARHGAP42 by the non-receptor tyrosine kinase Src and the subsequent downstream effects on ARHGAP42-mediated de-activation of GTP-bound (active) RhoA through engagement of RhoA’s GTPase function. The changes in ARHGAP42 and RhoA activities were correlated with changes in RhoA-regulated actin cytoskeletal dynamics and cell motility in mouse embryonic fibroblasts. ARHGAP42 associates with actin stress fibers and focal adhesions, is auto-inhibited by its N-terminal BAR (Bin/amphiphysin/Rvs) domain, and is activated by Src-mediated phosphorylation of tyrosine residue 376. Following this Src-mediated activation, ARHGAP42 de-activates RhoA through GAP-stimulated GTP hydrolysis which results in increased cell migration mediated by dynamic changes in focal adhesions and the actin cytoskeleton. 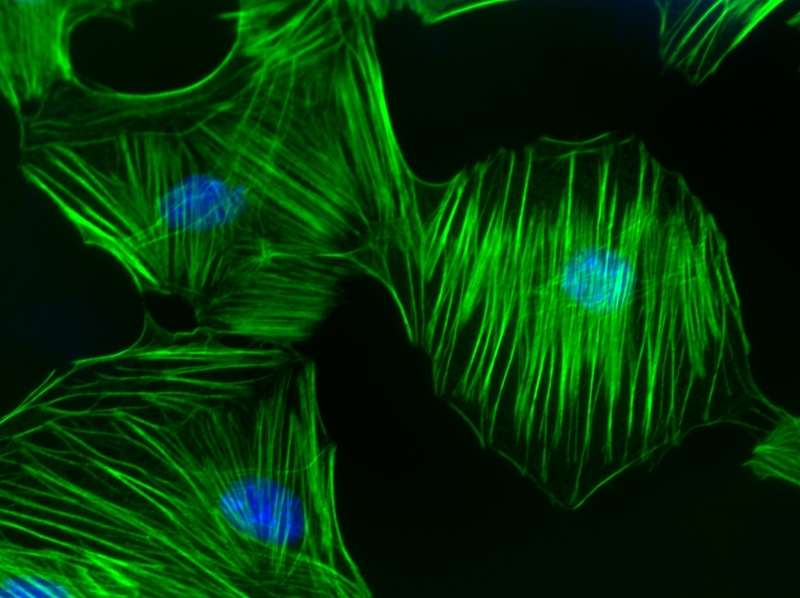 Cytoskeleton’s RhoA G-LISA activation assay kit and RhoGAP assay kit (Cat. # BK124 and BK105, respectively) were essential reagents in this study, providing the tools necessary to measure the activities of both ARHGAP42 and RhoA to describe the novel functional regulation of ARHGAP42 by the non-receptor tyrosine kinase Src. Luo W. et al. 2017. ARHGAP42 is activated by Src-mediated tyrosine phosphorylation to promote cell motility. J. Cell Sci. doi: 10.1242/jcs.197434.